Fit Indian Run: How can I enjoy running? I was chatting with couple of my friends and they asked me a very simple question – how do you enjoy running? I knew that it was not an easy one to answer because of the perception in our community that running so late in life could be painful and extremely boring. My unpretentious response was that I did not enjoy my first few runs but now I am attuned to it and I relish it thoroughly – I just had to cross the threshold to experience the runner’s high. Now, I like everything about it. The feeling of accomplishment, the positive mental benefits, and the way my body feels afterwards. Furthermore, running gives me sanity and keeps me real. Before I share my ideas based on personal experience, here is one advice – “just pull up your socks, lace up your shoes and get out of the door – anytime is a good time. After that it is a piece of cake”. Listen to music – Whatever is your favorite. Mine is Kishore Kumar. Listening to music when you on a run will take your mind off of your heavy breathing and how much farther you have to go. Switch locations for outdoor runs – Change is refreshing and enjoyable. Always look for different tracks, trails or sometime go on treadmill too. Every city, town or village has a place or two which can be used for outdoor running. I grew up in Bokaro, a small town in India – I vividly remember City Park where people used to go for a jog every morning. Run comfortably with proper gear – You don't need any fancy running gear but a good pair of running shoes, synthetic socks and technical fabric clothes will work magic. Don’t run too hard – It is good to push yourself but know your limits and don’t overdo them. 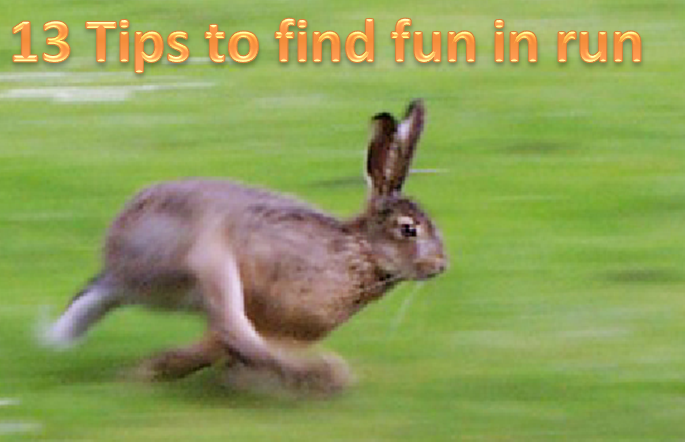 You should avoid competitive running when in for fun and fitness. Don’t use any stop watch initially – I will advise against using any watch in the beginning so that your focus is just running and nothing else. Timing your initial attempts and then comparing with others may dampen your spirits. Use mental training to overcome your mind-speak – Your mind will suggest you to stop but keep telling yourselves - this is expected. Rehearse running over and over in your mind to bring into line with the way that you act and think. Reward yourself – It is a good idea to treat you after a run. It could be another running gear, Nike shirt or even writing an article in a blog (like me). Notice change in fitness level – In a few days of running, you will see a drastic change in the BMI (Body Mass Index) which alone would be enough to inspire you to move forward. Your endurance and stamina will also elevate to a higher level. Run with friends – If possible, look for few like-minded people who can be your running buddies. This can help your workouts go by faster and also in following a running plan. However, running alone is also not a bad idea because then you have the flexibility of managing your own schedule. Rest period – Always keep a day off between long distance runs. I call it a healing time for your body and gives your running muscles a break. If you are a sporty person, you may utilize this time in some cross training activities like biking, swimming or light weightlifting. Eat well and sleep well and listen to yourself – This is very important for the sake of healthy and enjoyable running. Learn to listen to yourself to differentiate between usual run-of-the-mill aches and real injuries that need attention. Don’t ignore any warning sign from your body. Keep the balance right and your will enjoy running. Run with a goal – I will strongly suggest you to sign up for a 5k run or any fun run in your community or city. Promise to yourself that you are committed and will complete the run, no matter what, at least this one time. Doing it “one time” will give you enough energy and motivation to do it again and again. Share your experience – Let your friends, family and online community know what you are up to. Trust me – you efforts will be fittingly appreciated and encouraged. That works like a magic and gives you lot of mettle to overcome the challenge. I'm not an expert by any stretch of the imagination, but those are just few things that I have found helpful over the past year. Remember - Running isn't just fun, it's an exclusive life style.